No renovation is routine, but none are more challenging and stress-inducing than reno rescues—when a client has either hired an incompetent contractor and is now worse off than when they started, or attempted to undertake the project themselves, with disastrous consequences. Although most people accept that the price is the price when it comes to something like dentistry or a new suit, and that even a luxury vehicle has only marginal room for haggling, they will all too often opt for a cheaper quote for a major renovation, even if it comes without a warranty and could theoretically put them at financial and physical risk in the future. “People ask us if we’ll do partial cash,” Gatti says. “Well, no we don’t. First, it blurs the lines. Even if I’d ever consider it, I can’t do half the job in cash and half on the books, because how do I warranty the work? And it would be hard to get a contractor to do follow-up repair work if they couldn’t get their plumber or electrician out because they were paid cash. What follows are four stories of homeowners who didn’t follow that advice and paid a big price for trying to cut corners—and the professional renovators who helped stop the tears and save the day. An $800,000 Reno…With No Permit? by Chris Phillips, President, Greening Homes Ltd. This story began in 2013. The home, a 100-year-old semi-detached unit of masonry construction, had just been purchased. The new owners decided to undertake a whole-house renovation. 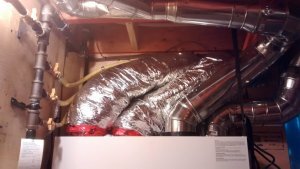 One of the new owners had a medical condition that made indoor air quality very important, so they understood the need to select building materials that would keep chemicals out of the indoor air. They met with 12 different contractors and gave themselves two months to decide who was best able to do the work. Although this was a major renovation costing approximately $800,000, the contractor they chose insisted that no building permit was needed. The house was gutted, new plumbing, heating, ventilating and air conditioning added, and new walls and drywall put up. At this stage a painter was called in and he noticed that some aspects of the construction just weren’t right—that some of the construction work seemed to be out of sequence compared with typical building construction progression.At this point the homeowners had spent about $500,000 and were not liking what they were hearing. The painter contacted me and I met with the homeowners and looked through the home. Evidence of shoddy workmanship was everywhere, including structural problems such as cut floor joists to allow for heating duct runs. Compromising structural components to put in heating or plumbing is never the correct thing to do. I brought in the municipal building inspector to get a third-party assessment. Unfortunately for the homeowners, the inspection made it clear that the entire house had to be re-gutted and re-done with proper permits and licensed trades for plumbing, wiring and gas fitting. By this time the original contractor had changed his company name and would not return messages. Even though the homeowners were clear with the original contractor about the importance of protecting indoor air quality for health reasons, no effort seemed to have been made to address this, and many of the materials chosen would have made matters worse. During the planning process we looked at over 50 different materials, including the chemicals from which they were made, and cross-referenced that information with the known triggers for the client’s medical condition. The clients have been unable to get their money back from the original contractor. As a result, they have had to refinance their home to complete the work and take other financial measures that have made their life more difficult than it should be. While they went through a significant vetting process, their contractor’s insistence that no building permit was needed should have been a red flag. A renovation project of this scale and complexity will always require permits and multiple inspections. 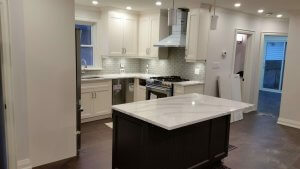 The TV renovation shows make it look like a complete reno can be done in very little time. This isn’t how things actually work. Even preparing a proper estimate for a project of this size takes me 40 to 50 hours of work. Homeowners should expect to pay for estimates on major renovation work. The idea that a contractor can simply walk through your house and give you a firm price when a significant renovation is involved is simply not realistic. Well, she’d had a renovation the year before where a cabinetmaker had removed the walls on the main floor. I asked if she got a permit, but she said no. I asked, “Is he a licensed, insured contractor with RenoMark or BILD?” Same answer. She said she was a lawyer but not in this field. She had a simple contract for the parts and kitchen work, but nothing for the underpinning work. She tried to get in touch with her contractor, but he didn’t pick up the phone. So we applied for a permit, underpinned that section properly, removed the drywall on the second floor, did the framing and spray-foamed everything, installed new wiring on the second floor and fixed the problem. A day before the judgment, the contractor settled. But my client probably would have saved $21,000 if she’d just gone with me first. The number belonged to another contractor. Putting licence numbers on trucks became an Electrician Association rule, but I think it’s a really stupid rule. The (perpetrator) took one of those numbers and put it on an invoice and went out there and started cheating people. They never found him. By Joe Gatti of The Gatti Group Corp.
We got our engineer in there to do an as-built drawing and make sure things were structurally sound, and then applied for a permit. Their contractor had also had his engineer do some drawings, but when our engineer looked at them, he said they were absolute garbage. And they were (drawn) on the drywall! The one scary thing—and we always tell people this—is to stay away from the one-man show. We have a booth at the Ontario Home Show and a lot of people see it as a bad thing that we hire trades and aren’t hands-on, doing everything ourselves. Well, you cannot be an electrician and a plumber and a gas-fitter and a carpenter and a drywaller. I’ve never met anyone who carried four licences! You’d be 40 years in apprenticeship. You don’t want anyone who says they can do everything—manage the project, buy the materials, do inspections, deal with you, deal with the designers, swing a hammer and do the electrical and the plumbing. The project was to gut the main part of the house—550-600 square feet—and open it up. Take a load-bearing wall down, a little partition wall and open up the kitchen. The two bedrooms just needed new flooring, paint and doors. All new electrical. We repositioned some new components in the bathroom and everything was upgraded—a small but quality project. But it was a long process, including waiting for one of the trades we deal with, as well as dealing with the city—that took an extra month. So now the clients are two months in, living in the basement and using the laundry as a kitchen sink. And with every delay they go, “Oh great, you’re no better than the other guy.” You can’t win for trying. But those are the sort of situations you find yourself in if you do these jobs, which is why we don’t do many of them. But it’s sad to see people getting hosed, especially when it’s so blatant. In the end, they were happy to see us go, but grateful too. The other day I got a call from them to do another renovation. by Sam Lapidus, president, Keystone Ridge Developments Ltd.
A year ago I had a very nice couple in the Dupont/Bathurst area who decided they were going to do an addition on the back of their house. They had permits, but the contractor they hired decided not to follow the permit drawings and was building them a bigger addition than originally decided. They told me they didn’t ask for that—that the contractor had decided to do it on his own. He’d dug down to the foundation and had started to prepare the footings, and then they got a stop-work order. In the period between receiving that order and finding me to do the work, they had water penetration into the basement, which caused all kinds of damage to areas of the house they weren’t intending to renovate. 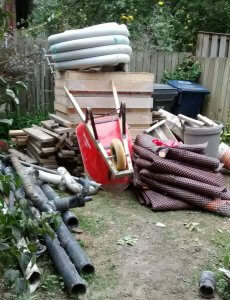 The contractor had taken a deposit for greater than the amount of work that had been done to date and disappeared. 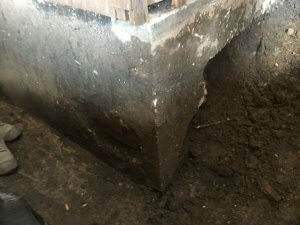 And not only had the footings been prepared to be poured in a larger footprint than they had a permit for, they were also done completely backwards. Had they actually poured the footings and done the foundation walls, the possibility of the addition sinking was very high. We had to remove everything that was there and start fresh. The engineer said we needed to do some further excavation to get down to get to native, undisturbed soil, so they ended up with larger footings. And, of course, we had to build to the specs of the permit. The whole project—a simple one-storey addition, moving their kitchen back, at the back of the house—took about two months. Between what they paid their previous contractor and what they had to pay us to get them back to where they were to begin with, it probably cost them $50,000—on what should have been a $60,000 job total! So pretty much double the price. It’s all the wasted time too. The previous contractor had probably been working there a few weeks. But he wasn’t showing up every day and wasn’t making progress. I was able to bring a Bobcat around the side of the house with a deep arm and shovel. I could have dug that out in two days, put the footings and steel down on day three, and on day four I could have had the inspection. I know there must have been tears with all they had to go through—fighting with this guy to show up, to give them back money, to rectify the situation. Plus, he’d left them in an unsafe condition. Through the OHBA, I sit on the Health & Safety Committee and I’ve been working with the Ministry of Labour as a member of the Construction Health and Safety Action Plan. The violations were everywhere. I’m shocked the inspector didn’t call the Ontario Ministry of Labour. It might not have been quite that extreme, but it looked like someone had gone in with a sledgehammer and punched holes in the wall so they could access places to run electrical, except that he was running extension cords! I guess he figured that was easier than running proper Romex cabling. The house was a firetrap. And it was a semi, so they put their neighbours at risk too. I looked at it and thought it was going to be a headache with the physical situation, and I didn’t think the domestic situation was going to be easy to navigate either.